When it comes to cookies, I like them rather plain and not overly sweet. This traditional cookie from the Bretagne (Brittany) in France is so plain and simple, that the ingredients really shine. It is made of flour, sugar, egg, and the famously delicious salted butter (beurre demi-sel) of the region. Somewhat related to shortbread or sablé cookies but not as rich, for me they are almost the perfect cookie, and very more-ish. The salted butter is the key to this cookie's distinctive nutty, buttery sweet-salty flavor. The best salted butter from the Bretagne and other regions along the Atlantic in France are creamy-fresh and rich, with little glistening crystals of salt still visible. If you can get a hold of really good salted butter, you can use traditional recipes and the cookies will turn out the way they should. If not, some adjustments need to be made. So, I would recommend following the variation of the recipe that meets your butter quality. Version 1: Use this version if you can get really good salted butter with a slightly cultured (sour) taste. Version 2: Use this version if you are using supermarket-level salted butter, but you don't want to mess with adding salt and so on. Version 3: Use this version if you don't have access to cultured salted butter, and want to replicate the salty/cultured (sour) taste as closely as possible. Mix together the sugar, salt (if applicable) and butter. Add the flour mixture and rub well into the butter-sugar mixture with your fingers. Add the egg and vanilla if you're using Version 2, plus just enough milk or buttermilk so that the dough comes together cohesively. Form into a ball, flatten and wrap in plastic. Chill the dough for at least an hour, until firm. This dough is quite soft so this chilling step is very necessary. Heat the oven to 180°C / 355°F. Line baking sheets with parchment paper or silicon liners. Flour your work surface and a rolling pin. Roll out the dough to about 3mm / 1/8 inch or so thickness. Cut the dough out into shapes. Put the cut out dough onto the lined baking sheets. Bake for 10 minutes, then rotate the baking sheets. Bake for another 5-7 minutes, until the cookies are a golden brown on top. Cool completely on a rack - these are cookies that taste a lot better when cooled and crispy, rather than soft from the oven. Store in an airtight container. 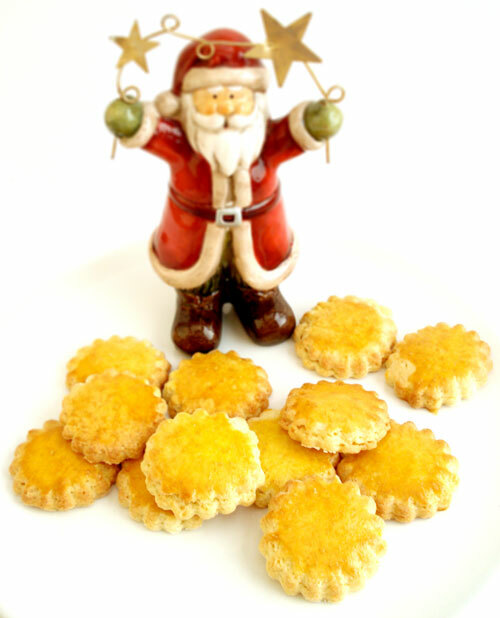 A few years ago, way before this blog was even a glimmer in my eye, I decided that I was going to decorate our Christmas tree with iced spice cookies. I was inspired by the gorgeous photos of large trees covered with big iced cookies shaped like Christmas ornaments and penguins and such that appeared in - yes, you might have guessed, Martha Stewart Living. Once I committed to this, I had to see it through. Our tree wasn't huge, about 6ft / 180cm or something tall, but it took ages to make enough big cookies to adequately cover it, even though we also decorated the tree with several glass ornaments, not to mention the fairly lights. I was baking cookies and icing the beasts for a solid week. I made about 200 cookies in total in the end: about 150 of them ended up on the tree, 20 or so fell and crashed while I was trying to hang them, and the remaining ones ended up as gifts, wrapped in cellophane. When the tree was finally decorated with all those cookies, it really looked spectacular. (The photos were taken on a pre-digital camera...and the photos are packed away in boxes, awaiting our soon-I-hope move.) Besides looking great, it smelled wonderful too. My plan for those cookie-ornaments was to serve them with coffee after a Christmas party. I imagined the scene...friends gathered around the tree, picking their favorites...the village church bells ringing in the background...as I lovingly touched one of the hanging cookies. What greeted my fingers was...soggy sponge. The icing side was ok, but the exposed cookie side was almost wet. Dismayed, I inpected the other cookies. They were all the same - heavy with moisture. I took one off and bit into it. Ugh! It had absorbed Essence of Pine from the live tree. I spat it out. I don't remember what I did serve at that party, but it certainly wasn't Soggy Pine Cookies. Thankfully, the cookies did manage to hang on the tree until we put it all away a week or so later. When I originally wrote this back in 2008, I really didn't think we were going to be moving away from Switzerland to France. But now 3 years later - here I am. We even considered living in Brittany for a while before settling on Provence. A lot has happened over the past 3 years. Looking back on recipes I've written out in the past brings back all kinds of memories - of our old house in the suburbs of Zürich; of people who are no longer with us, especially my father and Martha...and a lot more. So if you care to, please share a dish or recipe that brings back special memories for you, good and bad, in the comments. Submitted by maki on 2012-12-21 09:42.
oh, i've always wanted to have christmas tree decorated with cookies and sugar canes like the ones you see on tv... but i live in brazil, and well can you imagine a bunch of candy just hanging there during the summer? I just had to try this recipe today. I went for Variation 3. It was so easy to put together, the dough was a bit soft but I refrigerated it for several hours and it was fine. And oh dear they are so addictive! I may just have to make another batch for Christmas day! Thank you Maki and Merry Christmas to you & yours! 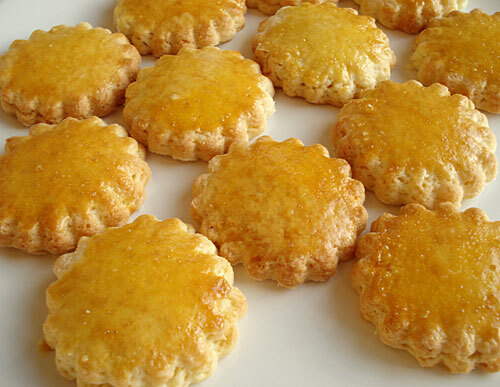 Oh, those are my favorite cookies, but they are so easy to find in France that I've never thought about making them! Now I have to try!!! Happy holliday to you Maki, thank you for your wonderful blogs! Dear Maki, u have suchhhhhhh a lovely blog!, the cookies are a beauty!, would love to try them! !in fact would be trying out some of ur recipes soon. I just made these! I've been trying to bake as many local specialties as I can find and I loved these simple, tasty cookies! Yours are so pretty! Looked like an interesting alternative to shortbread cookies, so I gave this a try. I used supermarket-quality salted butter, and cake flour. I followed the recipe, but found that they just didn't rise like they appear in the pic. Consequently, I ended up with about 40 x 6-in. biscuits that were all about 1/8-in. thick. They were good, but the fact they didn't rise was a bit disappointing. Wow! I've been looking for a good recipe for these. The Bonne Maman ones in the UK supermarkets are nice, but homemade is always better. I'll have to give this recipe a try - thanks for including the different variations. I tried the recipe with my 2yr old and we had great fun! I love the Bonne Maman ones so was really hoping these would be good. I don't know what cake flour is (not sure we have it in England - or its called something else - ), so used self-raising and no baking powder. They did rise more than I expected (I pricked them with a fork) but they are nice. I would like them to taste more sweet so I will add more sugar next time (poss 1/3 to 1/2 again extra). I used Caster (english spelling!) sugar too! just re-read the recipe and I mis-read the sugar - 120g less 2 tbs. I put in 2 tbs!! - but regardless, they are still very nice but not highly sweet as bonne maman galettes are. P.P.S. Damien again, In England we have c and f temp grades, but also GAS MARK. 180C is Gas Mark 4. Arrived at this site via a circuitous route looking for a Traou Mad-like recipe. What a delight your blog is. I read further about your Xmas tree/cookie disaster and would suggest that you do what the Swedes do (my grandmother was Swedish and it's a wonderful country): use the very thin, crisp gingerbread cookie they call Pepparkakor, which sometimes you can actually get at World Market. They can be cut out in stars, animals and gingerbread-boy shapes with tiny holes in the tops so you can hang them on the tree. It's easier to buy them than to make them, however; I've tried, and rolling them as thin as they need to be is vexing! Hi! Thank you so much for the detailed blog! I absolutely love them, and really want to have some around for entertaining; but at about $4 a box for only 9 cookies, they sure are expensive! They have an exquisite texture, and the flavor reminds me of the Yoku Moku cookies from Japan. I wanted to see if you were familiar with this product, and if your cookies were similar? I'm not too keen on the different types so I wanted to check with you first Thank you so much!! I will out your recipe soon, hopefully can get my hands on some good butter shortly!